Big Train controlled the game to defeat the T-Bolts 14-3. This game keeps Big Train ranked in first for the Cal Ripken Southern division with a record of 30 wins and 5 losses, continuing their win streak to four wins. The T-Bolts remain in fourth in the Northern division, now with a record of 14 wins and 21 losses. Consistency was the key tonight for Big Train, scoring runs in every inning but the first. After a scoreless first inning from both Big Train and the T-Bolts, Bethesda claimed the lead in the second inning with Justin Wylie (University of Arizona) scoring off a single from Ben Martz (Santa Barbara City College). Big Train extended their lead to 2-0 in the third inning. Tyler Villaroman (University of San Francisco) made it to first base on a walk, stole second with Carson Taylor (Virginia Tech University) at bat, and then made it home off a single deep into right field off the bat of Justin Wylie. The fourth inning brought home two additional runs for Big Train, including a homerun from Udie Summerall (Florida Atlantic University) to start off the inning. The second run came from Fox Semones (James Madison University), who made it on first with a walk, stole second with Carson Taylor at bat, and then ran his way home off a line drive from Taylor into center field. 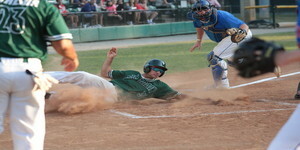 Big Train continued to extend their lead, earning an added three runs in the fifth inning. Bryan Diaz (Nova Southeastern University) made it to second base at the beginning of the inning with a deep drive into centerfield. Up next for Bethesda was AJ Lee (University of Maryland), who made it on first with a walk. Udie Summerall then stepped up next for the Big Train, hitting a double, allowing Diaz to score and Lee to get to third. Lee made it home and Summerall advanced to third off a wild pitch from the T-Bolts pitcher with Ben Martz at bat. Summerall ended up scoring for Bethesda off a line drive hit from Fox Semones into left field, bringing the score to 7-0. In the sixth, Big Train scored another run from Alec Burleson (East Carolina University), who made it home off another wild pitch from the T-Bolts. Bethesda earned their final six runs in the seventh and eighth innings, scoring 2 and 4 runs respectively. Tyler Villaroman made it on first with a groundball hit towards second. Carson Taylor, up next, made it on first base on a hit by pitch from the T-Bolts pitcher. Villaroman ended up making it to third off an error from the pitcher again. Villaroman made it home and Taylor made it to third off a fly ball hit from Burleson into center field. Taylor ended up making it home off a sacrifice fly out from Andrew Shebloski (St. Mary’s College (CA)). In the top of the eighth, the T-Bolts earned their three runs of the game in an attempt to make a late rally. Turner Davis made it on first with a groundball hit towards second. He advanced to second off a wild pitch from Big Train with Cal Villareal at bat. Villareal made it to first off a Big Train error, and Davis made it to third off that same error. Up next for the T-Bolts, Devon Jeffreys made it on first with a groundball hit into left field, bringing Davis home to score and Villareal to second. Both Villareal and Jeffreys scored off a double from Raven Beeman. Big Train remains at home tomorrow to take on the Gaithersburg Giants in a 7 p.m. match.